As college football moves ever so closer to starting, it is time for another year; another game from EA. NCAA 11 offers some new and exciting features bringing a new spark to the series as some started to think it was burning out. 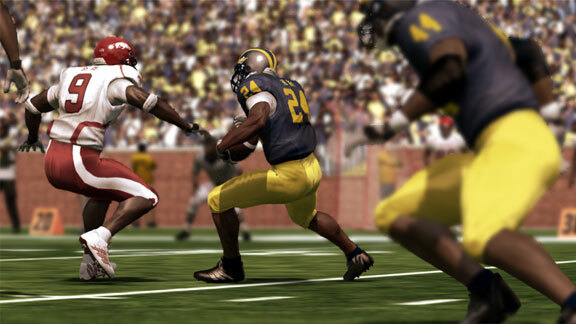 NCAA Football 11 truly separates itself from its older brother series, Madden. The NCAA series has always sold well, but this year it truly creates a new and exciting feel to the college football experience. Most of you like myself sit there and ponder each year around this time if you should get the popular NCAA game. It's the same game as last year right, I say to myself. No, lets start off by saying that it feels and plays like all the past NCAA Football games but does create many new exciting features. I mainly got it this year because all my buddies play it and I needed some game to hold me off till September. I put it the disc and started a quick game to be amazingly shocked on how new the game plays in certain aspects. Like I said earlier, the controls are the same. You won't be hit with many new controller features or-such so. The first thing I noticed was how much better this years blocking was. I remember in NCAA Football 10 being swarmed as a QB because my offensive blockers were playing at the level of high school kids. They really got the offensive blocking scheme worked out great, and to go along with that, the running has improved. I really felt that the running was more loosey-goosey and gave you freedom. I didn't feel like I was being told where to go once I got past the line of scrimmage. The game gives you many opportunities to break tackles, accelerate, and surprisingly help hold onto the ball. Defensively, I did not notice as many changes. The one change I did notice was that the breaking of tackles by the offensive was toned down a lot. As a defender, you really can make tackles you would see college players making. If you go for the feet with a hard tackle, there will be a good chance you will make the tackle instead of seeing the running back going 60 yards for a touchdown. The AI has improved the most without a doubt. No more throwing your controller into the ground because your wide receiver had a ball go through his hands three passes in a row. This year the really focused on what the AI can do. If your AI intercepts the ball beside the sideline, they will not automatically step out of bounds. It really shows a lot of work by the developers, and it really pays off as a gamer. Visually, the game looks better than ever. The lighting and backdrops look absolutely gorgeous with everything being realistic. You will notice a lot of player detail with faces, sweat, and tons more creating an even more realistic experience. The fans still look like complete crap unless they are showing a highlight of the fans celebrating and such, but you can't really complain when your in-game. ESPN and it's integration really adds a nice touch to the game. There are issues with animations from time to time like missed hand-offs, but all-in-all they have greatly improved from past titles. The ability to position your body with the analog sticks can help your running back protect the ball and prevent injuries. Road to Glory, a mode that many enjoyed in NCAA Football 10 has not changed at all for '11. The exact same cutcenes are used which I find a little upsetting, but still is a fun mode to try out. Teambuilder is also the complete same, which is nothing to much to complain over. What NCAA Football 11 has really added to their firepower is the use of the internet. Well, this year's game basically turns any of your many PCs, Macs or iDevices into your recruiting and smack talking hub. This year the Online Dynasty Mode can come with you wherever you go. Whether it's in the form of passive e-mail updates when a game or week is completed or the more active choice of recruiting your roster of fledging stars from your laptop or iPhone, your Online Dynasty is always there. The online use is still a beta, but is running pretty smoothly on each capability. There is talk that it has its issues with the iPhone, but as months go along, I am sure these issues will be addressed. Also included in your Dynasty Hub online are the new StoryBuilder and Dynasty Wire. StoryBuilder allows you to select photos and videos, assign a headline and write a quick paragraph about how you just whoop your opponent's...well you know. It's simple, it's slick, and it works pretty well (surprised me). Of course, if you're too lazy to generate your own custom stories, the game will take care of it for you automatically. You can then upload these stories to Facebook or YouTube and watch the real smack talking begin. 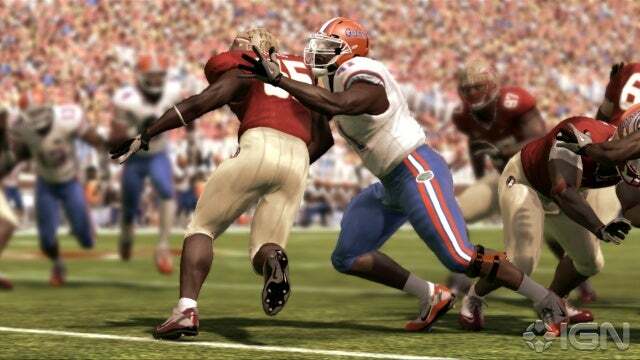 What can you say about NCAA Football 11? I can tell you that it is worth your money and that you will enjoy it a thousand times more than the past titles. It gives you a surprisingly new college football experience with the help of ESPN and the developers new changes. The game plays well, runs well, and will leave you chewing on your nails for this year's college football season.